Luscious organic Crown Prince squash. 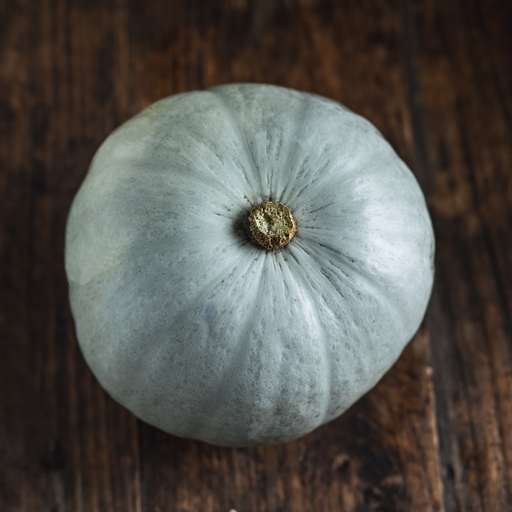 Blue-grey skinned with dense orange flesh, this variety is a favourite with cooks for its consistent flavour and all-rounder qualities. You can’t go wrong, whether you want chunks roasted to caramelised sweetness, buttery mash, or a slow-simmered, toothsome addition to a stew or curry. Roasted squash is good as a starter, drizzled with yoghurt and chilli oil; as a side, mashed with nutmeg, salt and butter; tossed in hearty salads; or stirred into risotto just before the rice is cooked. The dense flesh of Crown Prince holds its shape beautifully when cooked, making it a good candidate for using as a pie filling. It goes well with spinach and tangy goat’s cheese. Squash like to be kept dry and warm, at room temperature. A kitchen shelf or windowsill is ideal; the hard-skinned crown prince can live there happily as a rustic autumn display for up to 12 months before cooking. Once cut, keep the remainder in the fridge and use within a week.